On the connectivity side, there's a docking connector, micro-HDMI, USB 3.0, and a combination LAN or RS232 port. For wireless there's dual-band 802.11a/b/g/n WiFi, Class 1 Bluetooth v.4.0, u-Blox Neo-6Q GPS, and optional 3G or 4G LTE mobile broadband. There are two cameras, a 2MP in the front for conferencing and a 5MP document camera in the rear. Customers may also include an embedded 1D/2D barcode reader. The standard Li-Polymer battery (5100 mAh), which is hot-swappable, though power users may opt for the also available extended battery with double capacity. As is expected in a next-gen tablet, there's a full complement of sensors. Protected against water, extreme temperatures, shock and dust, the M101H offers the more durable solution. The operating temperature range while running on a battery is -10°C to 50°C which is good enough for most business and field environments, but can withstand temperatures of -20°C to 60°C while running on AC power; it can also survive a four feet vertical drop to concrete. With a built-in barcode scanner, the M101H allows you to track incoming and outgoing shipments, while storing and monitoring inventory information in the warehouse in real time. 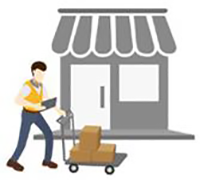 Warehouse staff can check a shipment's location status and locate inventory records instantaneously. The M101H also offers robust data collection with integrated barcode scanner and dual cameras. Advanced communications options such as WLAN, GPS, Bluetooth and optional 3G or 4G/LTE enable uninterrupted communications and connectivity. The "Haswell" powered rugged tablet can be securely mounted inside a vehicle with a dedicated vehicle dock, providing delivery route navigation and fleet control optimization. Upon arrival at the delivery location, our mobile rugged tablet, built to withstand shock, dust, water and 4-foot drops, can be quickly dismounted from the vehicle docking to assist in delivery confirmation, load adjustments, invoicing, reports, and more. As is, the new Winmate M101H 10.1-inch tablet clearly advances the state-of-the-art with its combination of bright, super-high resolution capacitive multi-touch display and Intel "Haswell" processor in an elegant, but hardened package that should have significant appeal to a wide variety of customers.